To edit voicemail settings click the pencil edit icon on the right of the extension number. Here you can edit voicemail settings. Starting version 4.2 remote access to voicemail by interrupting the greeting message by pressing “*” and entering the password is disabled by default. Go to your Fusionpbx installation menu. Enable and set true remote_access. To access an extensions voicemail away from the extension. Dial the extension and interupt the greeting with the *star key. Click the link above for setting up email server settings. 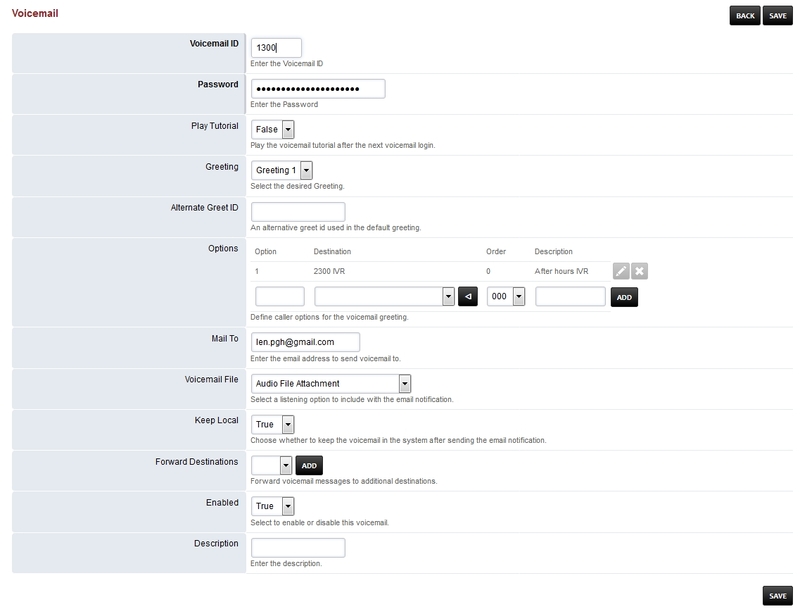 These are the settings needed to enable your FusionPBX installation to be able to send email notifications. Voicemail default settings gives the options to adjust voicemail settings on your FusionPBX installation globally. These variables can be set in advanced -> variables or in the dialplan. Wav file is the default voicemail message file type. MP3 requires mod_shout to be installed and running. When an extension is unavailable and no voicemail is configured, there is an option to play a message to the caller alerting them to this. To enable/disable this, change the option for the not_found_message setting in Advanced > Default Settings > Voicemail category to suit your preference. Please note that enabling this option means that the call must be answered in order to play the message to the caller and so the call will complete with a 200 OK rather than a 480 Unavailable or 486 Busy. In some jurisdictions this could potentially be illegal as it turns an otherwise toll free call into a chargeable one. FusionPBX supports Voicemail Transcription, where emails will include a transcribed version of the voicemail the email was sent in regards to. To configure this feature, see applications/voicemail_transcription.rst.